SG1566 has a vintage look and promises "sonic beauty". 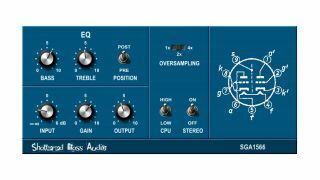 A virtual preamp, SGA1566 is a free cross-platform plugin from Shattered Glass Audio. It's designed to emulate the "sonic beauty" of a two-stage tube preamp. The design is loosely based on that of a single-channel vintage tube amp, but with added tone controls and stereo support. The original's circuit is emulated in real-time using simulation techniques. Suggested applications for the SGA1566 include to add warmth, as a saturation compressor or to add dirt via tube overdrive. You can download it now for PC and Mac in 32/64-bit VST/AU formats from the Shattered Glass Audio website. The developer suggests that you make a donation if you like it and want similar plugins in the future.